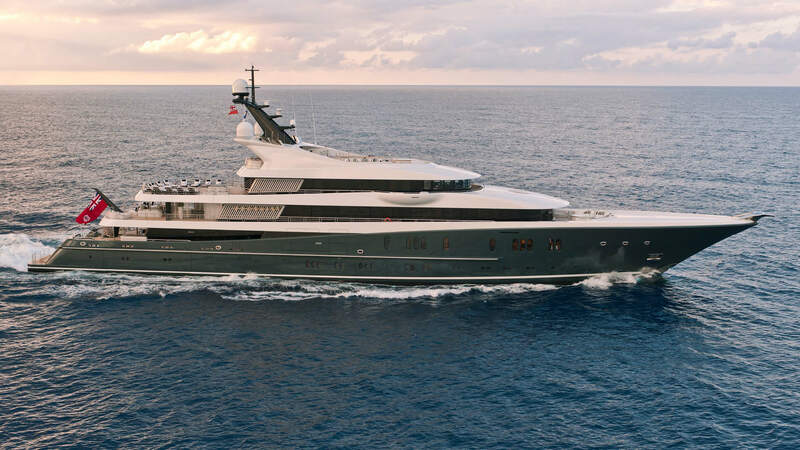 Sold and built under the supervision of the Moran Yacht & Ship new construction team, the 295′ (90.1m) Lurssen PHOENIX 2 is much more than a sequel to her predecessor PHOENIX. She was carefully designed and constructed to ensure that the original spirit of the yacht has been kept; but as her name appropriately suggests, she has been “squared” in both her complexity and size. PHOENIX 2, designed by Winch Design, is a much bigger and more beautiful yacht that incorporates elegant and sleek lines. She has more than 100 meters of stainless steel handrails that have been uniquely shaped and installed to fit these lines. Her sundeck offers a generous swimming pool with separate Jacuzzi and an exterior cinema. The sky lounge opens to an inside/out dining area complete with glass screens creating the ultimate dining experience. The owner’s suit is a beautiful full beam Deco Duplex reminiscent of New York in the 1930’s and offers breathtaking views of the sea. A private staircase joins the two floors together whilst a private foredeck complete with Jacuzzi offers exterior privacy to guests. PHOENIX 2 is, without a doubt, one of the most stunning yachts ever built. Moran Yacht & Ship sold the project, negotiated contract, wrote the technical specifications, and managed the build of PHOENIX 2 through her delivery.